Maybe you need to convert multiple kinds of file formats to PDF document everyday. Do you have a helpful handy tool? If not, please choose VeryPDF PDF Creator which is a virtual printer designed for you to create PDF document from any kinds of printable documents, including file formats of MS Office, OpenOffice, TXT, HTML, Webpage, AutoCAD, various image formats, etc. 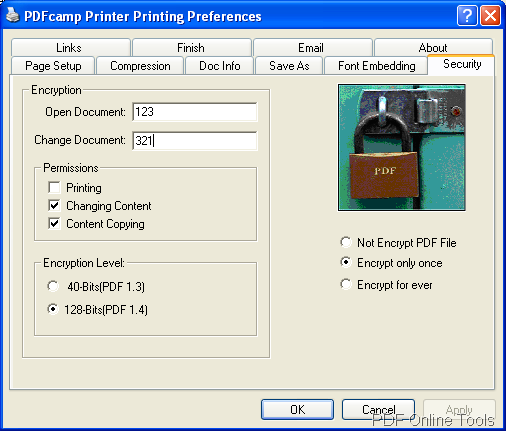 It is also a good tool for editing PDF description, encrypting PDF document, emailing created PDF, etc. 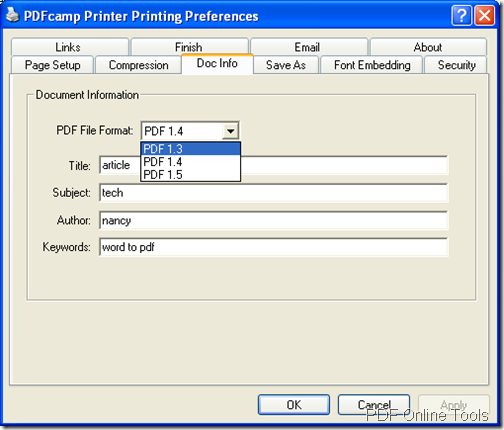 In this article, you will see how to use PDF Creator to create PDF document. Before knowing how it works, you need to download and install it on your computer by following the installation wizard. 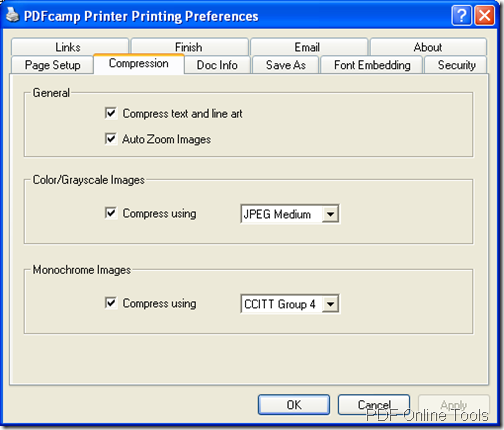 In the end of the installation, you will be reminded whether to set this virtual printer as default printer. 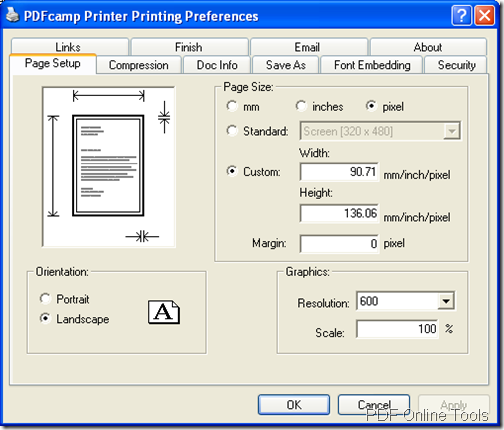 Of course, you are recommended to choose Yes if you need to create PDF document often. Please see the introduction for this application in below contents. 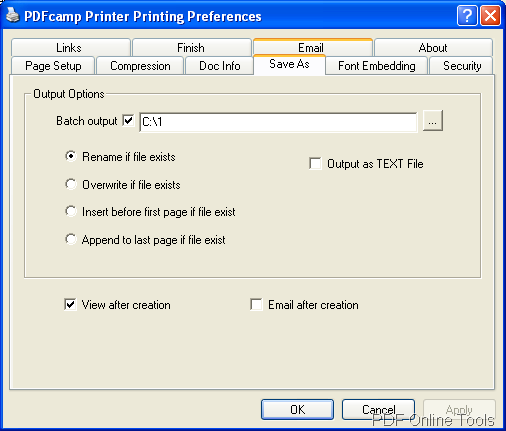 You will not see PDF Creator in your computer disk because it locates in Printers and Faxes folder. Please find it, right click the printer and click Properties—Printing Preferences to open the window which contains ten tabs. Then you can set different parameters in each tab. In this tab, you can customize PDF page size, page margin, page orientation, PDF graphic resolution, etc. according to your needs. 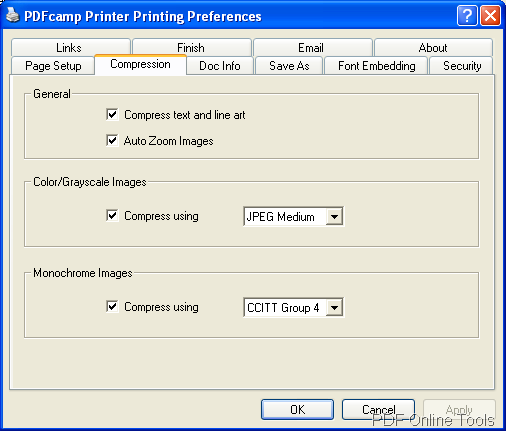 In this tab, you can compress color, grayscale or Monochrome image for created PDF document with different kinds of compression methods to reduce the PDF size. 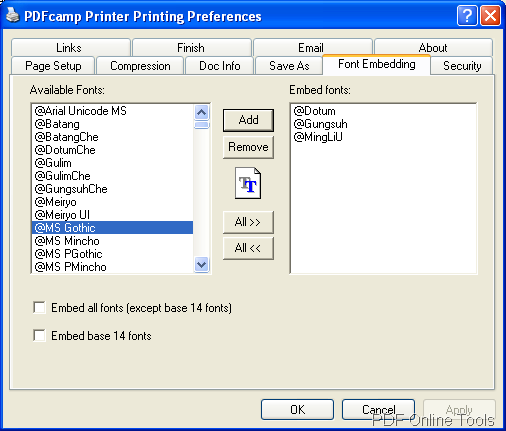 In this tab, you can choose the version for output PDF document for suite different PDF reader or viewer. You can also edit PDF description like Title, Subject, Author, etc. In this tab, you can choose the output location for target files if you want to create PDF documents in batches. You can also the rename methods. For viewing the target file at the first time when the conversion is over, please check the option View after creation. 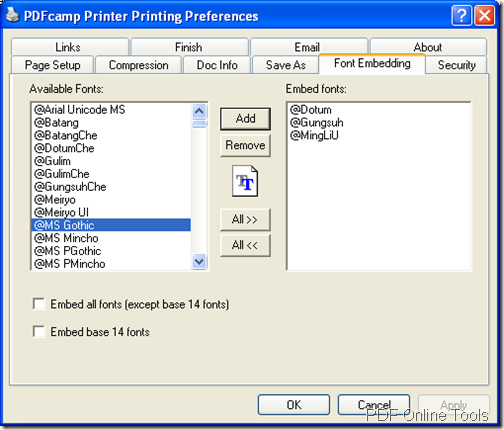 You can add all the fonts appear in source file in this tab so that the created PDF document can be successfully read in any PDF viewer or any computer. In this tab, you can choose to encrypt PDF by adding open password to protect the document from being opened freely or set permissions for protecting the document from being modified, copied, printed, etc. The encryption level can be set as 40 or 128-bit. This tab enables you to email the created PDF document to your friends, families, etc. via SMTP server. You just need to input the address of recipients, Outgoing SMTP Server, your authentication user name and password. 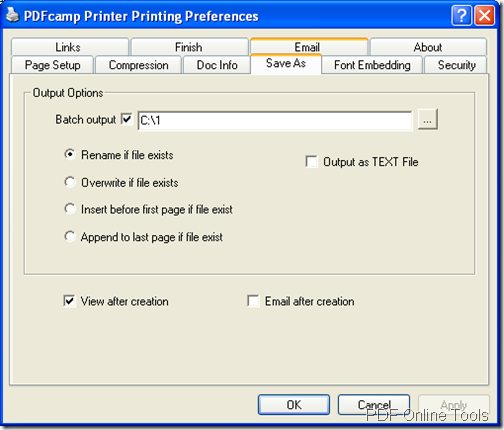 Then check Email after creation in Save as tab shown in Figure 4, this function will be activated. Then please click OK button. 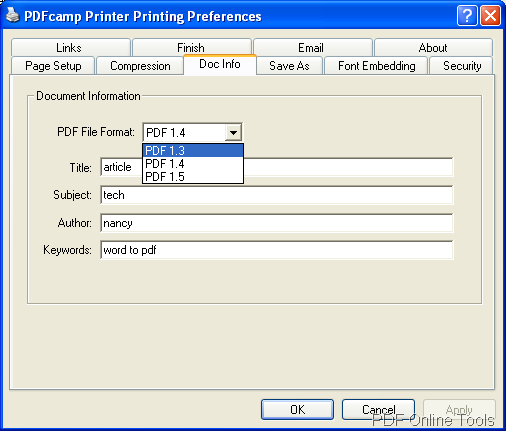 When you want to create PDF document, you just need to print the document to PDF Creator, then the conversion will be done. 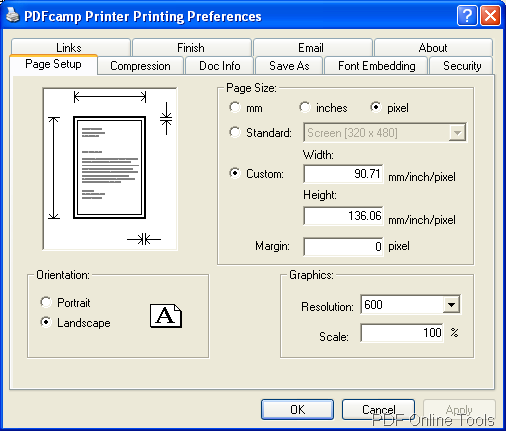 There are also Pro version and COM version of PDF Creator for your requirements. For more information, please visit its homepage.